My appointment with Safetouch was between 10 and 12. Anthony arrived a bit past 10 checked out my system, replaced a detector, and repaired another. He was efficient, courteous ,and professional. I would be proud to have him on my team of coworkers. Thanks again,Anthony. David P is a great team worker. He came to my house to assist Allen B with the work order per Allen's request. Issues arose that were unforeseeable. He was very knowledgeble and pleasant. He worked very hard to get the work done. Mr. Zach was very professional, polite and on time. He made sure I understood everything that he was doing and why it was being done. He did an excellent job. Thanks Zach for a job well done. Sam G, field service tech provided a very thorough servicing of what he came to handle. Provided insight to me on what he,was doing and shared other helpful information, and asking me questions to ensure I was comfortable with the service provided, in which I was very satisfied. Our experience with Safe Touch was nothing less than stellar! From the salesman Anthony who quoted the job, to the technician Alcides who installed the equipment; and the follow-up call from the office to check on our satisfaction. Thank you all! We highly recommend this company. Technician Zach S. was very professional and seemed to have a good knowledge of the equipment. Well-mannered and neatly dressed. Highly recommended. 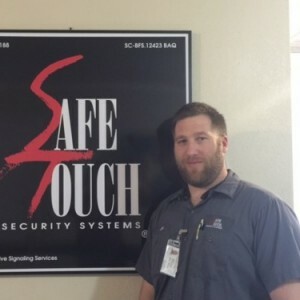 Nick B. worked on a problem we were having with our SafeTouch security system. He was professional, thorough, and very polite. An asset to the company. He left us with the alarm in working order. Safe touch could not assist us with all of our needs as they could not deal with any outdoor cameras, When looking for a company that can meet ALL of your needs, Safe Touch does not appear to be the one. Nick B. installed a replacement (update) system. He was professional, helpful in explaining how to add smartphone capability, and thorough. It was a pleasure to have his expertise "on the job." He's a five star! The first tech was too new and could not complete the work. We were hit by lightning and this made for difficulties. The next tech was great! His name; ALCIDES, IS NOT EVEN on your list?? He was able to figure out what needed to be done, finished; and explained the alarm instructions. Note: In the future, match the job with the ability of the tech! SafeTouch Orlando. Wonderful service. My Tech. showed up right ON Time. Was clean & nicely dressed, professional and friendly. Clayton took time to ask me where I wanted everything installed and explained each stage of the installation. Then Clayton gave me an educational review of how the system works. Explaining every detail. This was a re-install from my previous home to my new home. I have been with safe touch for two years. Love the system. Thank you Clayton. Alcides was awesome installer! Very quick and efficient. Explained everything to me. Polite and respectful. Very happy to have made the move to Safe Touch from ADT. The customer service experience has been great! Account - Clark - 4464 Tuscany Island Ct., Winter Park, FL 32792 Barry at Safe Touch Security Replace a defective board on my security system yesterday and he did a great job. Barry was very professional and thorough. He even made a follow up call to me and assisted with helping me add another pass code. Barry is outstanding!!! Thanks Safe Touch for employing such a good tech. Thanks Barry!!! Joe E was an excellent technician. He is a true value to your organization. *** *. did an excellent job in determining our problem and resolving it by replacing the modem and the sound board. He was very knowledgeable and courteous. He was unable to assist with getting the App running on our smart phones but did tell us about a key fob that could perform almost the same function. We would like to know more information on the key fobs and how to get them. Joe English was courteous, professional and very knowledgeable of his job. SafeTouch should be proud to have such an excellent Service Pro. SafeTouch Technician, *** *., was very professional and thorough. I couldn't have asked for a better technician. He went above and beyond to help me with a problem I was having with my alarm system. Joe E was courteous, professional and very knowledgeable of his job. SafeTouch should be proud to have such an Excellent Service Pro! Joe E was polite, professional, and quick to get the job done. I appreciate his technical knowledge, and going above and beyond to make this a successful, productive service call. Money well spent! Tech was very knowledgeable, courteous and answered all questions asked of him. He thoroughly checked the alarm system, changed all batteries to include the back up battery which had not been changed for several years. I would highly recommend Safety touch to anyone in need of security system. Service tech did perfect jobs. I was very pleased with the work that Joe E did in my home. He respected me and my home. He cleaned up after himself and explained everything he was going to do and then he explained everything he had completed. The service was great and the Tech went above and beyond to fix all problems thanks again !!! Joe was pleasant and knowledgable on the services he performed. We own a home in charleston, sc and did not hesitate a moment when deciding upon a security system. Joe was on time, efficient and worked with me on my schedule. Thanks! Joe E: Very polite and efficient! Good man! Joe E is a top notch technician. Professional and courteous!! Thank you for all of your help!! Joe E. came out for a service call to our home. He was professional, courteous and thorough. Very satisfied!! Joe was very professional and friendly. Your service just keeps getting better!